13 November 2005: Argentina is a federal state, made up of 23 provinces, a federal district and more than 1,000 municipalities. The country is predominantly urban, with around 83 per cent of the population living in cities. With a population of around 12 million, the capital city Buenos Aires, accounts for more than 30 per cent of the national population. 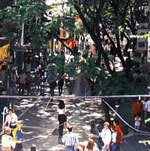 The cities of Rosario, Córdoba and Mendoza each have a population of more than one million and 39 others having populations of over 50,000. Provinces are the most important sub-national actors in Argentina and are responsible for a wide range of public services including health, education, water and sanitation provision. Direct elections are held for governors as well as provincial assemblies. Elections are also held for the position of intendente (executive officer) every four years at local government level. Municipalities’ deliberative councils are similarly subject to election, with half facing the electorate every two years to ensure that policy continuity within the council is maintained. Each province has its own constitution and determines the relative autonomy of its municipalities. Consequently some cities and districts may have more independence and powers than others, depending on a range of factors including economic, functional and political. For example, Córdoba province was one of the early reformers of its municipal system in the 1980s, granting absolute autonomy to those cities with a population of over 10,000 and increasing the amount it transferred to them to implement its public services. In response to the decentralisation of many public services during the 1980s and the privatisations of 1990s, further constitutional reforms took place throughout the country’s provinces. Many municipalities gained additional participatory mechanisms, including rights for citizens’ initiatives, referenda and powers to recall the intendente. In practice though, few of these powers have been used in local government. Municipalities generally have few powers and little financial muscle. They are usually responsible for defining land use, zoning, regulating pollution, waste collection, urban hygiene, lighting, street conservation and sewage. They have tended to suffer from a lack of financial resources. Although they have two sources of income, including user fees, they rely mostly on transfers from provincial governments. Historically municipalities have received between 5-20 per cent of such funds, although the average during the 1980s was just 10 per cent. Party politics at both the provincial and municipal levels reflects those at the national level. While the post of intendente is relatively minor, except in the more autonomous cities, that of governor is much more important; the position is seen as a stepping stone to national office, including the presidency. Although Argentine party politics consists of two main parties, the Peronists and Radicals, the majority of governors have been and are Peronists. Their affiliation reflects the legacy of Juan Perón who dominated Argentina’s political landscape both in government and in exile from the 1940s until his death in 1974. However, the Peronist label is a loose one and has included politicians of both statist and neo-liberal tendencies. 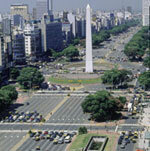 Carlos Menem, the Peronist governor of La Rioja, was president between 1989 and 1999 and pursued a policy of economic liberalisation and de-regulation; Nestór Kirchner, the current president, was a former Peronist governor of Santa Cruz, but unlike Menem has adopted a more hands-on approach to government. During the 1980s first the military government (1976-83) and its later civilian successor, pursued a policy of decentralisation. New responsibilities for the health and education services were imposed on the provinces, partly in response debt crisis and pressure to restructure both the state and the economy in its aftermath. However, while the centre was reducing itself, it failed to match the transfer of responsibilities with revenues. Although provinces have their own revenues on which to draw, they have also required transfers from the federal government. Prior to the 1980s the federal-provincial arrangement was split evenly. Through the 1980s this situation deteriorated and many provinces found themselves dependent on discretionary grants by the federal government to make up the shortfall needed to pay for their new service obligations. In 1988 an agreement was reached between the federal government and the provinces. The provinces would receive 56.66 per cent of federal revenues but discretionary top-ups would be ended. The agreement, based in law, lasted until 1992 when Menem, having recently introduced a new financial package that tied the peso to the dollar, needed to control spending, reduce the national deficit and avoid inflation. Aided by a Peronist majority among the governors he secured an agreement to set 15 per cent of transfers aside for social security and pressed for economic reforms to take place at the provincial level that were similar to the privatisation and de-regulation policies he was pursuing at the national level. This agreement was later followed up by constitutional reforms in 1994 and a law that ensured federal transfers could not fall below the 1994 level. This had consequences later on, given the positive economic situation in Argentina during that year. When the law’s conditions ran out in 1996, however, agreement between the federal and provincial governments was not easily resolved. By now Menem was into his second term, a lame-duck president and jockeying was taking place among the governors over who would be his successor. No agreement was reached and against a backdrop of rising fiscal and economic uncertainty in the late 1990s, the governors pressed their claim for a greater share of the revenues. The newly elected Radical president in 1999, Fernando de la Rua, had little leverage over the Peronist governors and was unable to get them to reduce their demands and demonstrate self-restraint. This resulted in the federal government failing to meet its commitments to the provinces, which contributed in part to the government’s default on the national debt at the end of that year.